A clutch pilot bearing is used to support the input shaft of the transmission. Replacing a pilot bearing should be included when replacing a clutch assembly which will help the clutch disengage. The pilot bearing is positioned in the end of the engine's crankshaft and helps support the opposite end of the transmission's input shaft which is an important part of how the clutch works. This bearing allows the input shaft to stop spinning so the car's gears can be shifted. 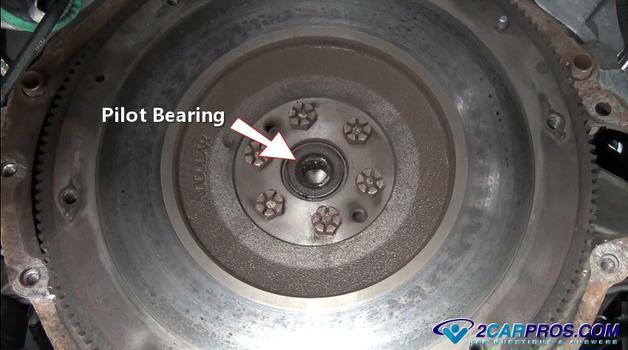 This bearing may not be included in some front wheel drive cars because the bell housing is shorter and the input shaft can be supported within the transmission and does not need additional support of the pilot bearing. The pilot bearing is self lubricated which can sometime run dry. When this happens the needle rollers inside the bearing will come apart allowing the input shaft and clutch disc to wonder inside the pressure plate and flywheel causing the clutch not to disengage by not allowing the input shaft of the transmission to stop rotating. How Long Does a Pilot Bearing Last? A pilot bearing should last the life of the clutch, but as bearing do they can have a failure within 45,000 to 65,000 miles in some cases. The cost of a pilot bearing will range between $7.00 and $23.00 (US) which you can get from Amazon or the local parts store if you are doing the job yourself. When having this job done at a shop the transmission and clutch will need to be removed, the labor will run between $350.00 and $650.00 (US). 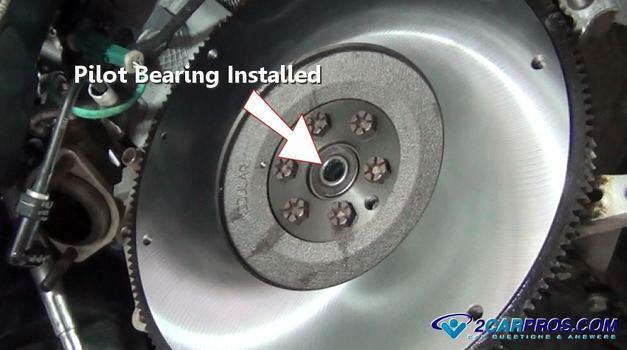 If you are replacing the entire clutch as a kit the pilot bearing will sometimes be included. Check the contents of the kit to be sure. 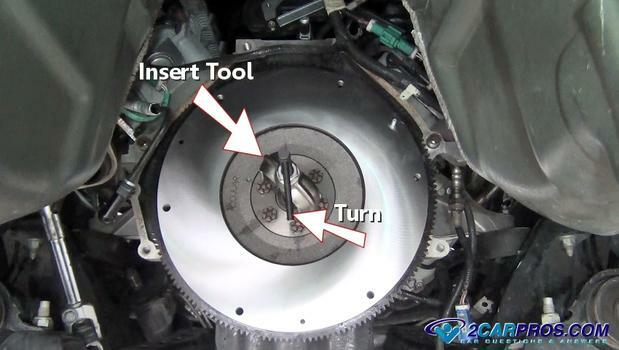 Before you begin the transmission will need to be removed along with the removal of the clutch assembly. 1. Obtain a Pilot Bearing Removal Tool: To remove the pilot bearing you must have a removal tool which you can buy from Amazon starting at $34.00 or you can rent one at your local auto parts store. It would be difficult to do the job without it. 2. Insert the Removal Tool: With the jam nut fully backed off insert the tool into the pilot bearing. Then turn the handle clockwise to spread the tool fingers outward behind the bearing. The body of the tool will rest against the flywheel which will support the pulling process. 3. Pull The Pilot Bearing Outward: Grasp the tool firmly and use a wrench to tighten the jam nut you will hear a small "pop". 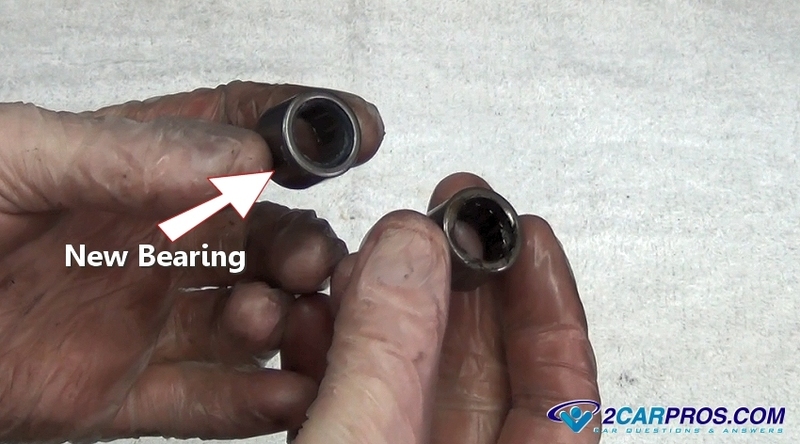 This will signal that the bearing is starting to move outward from the crankshaft. At this point the nut will get easier to move along with the wrench. 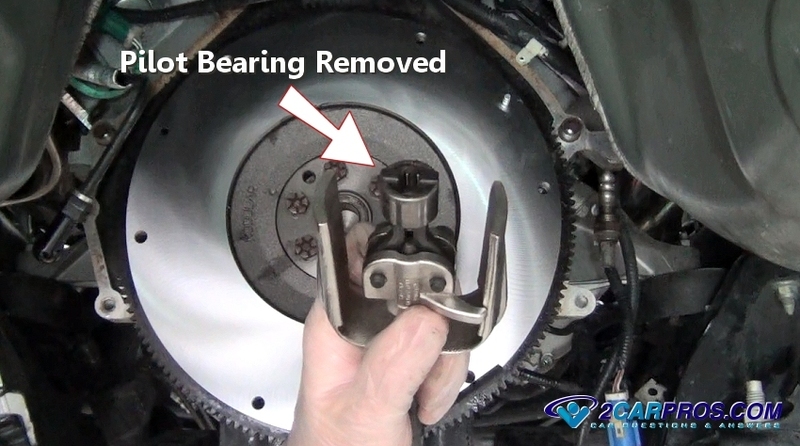 Continue this action until the bearing is fully removed. 4. Inspect the Pilot Bearing: Once the bearing has been removed inspect the end of the crankshaft and bearing which will be held in the tool. 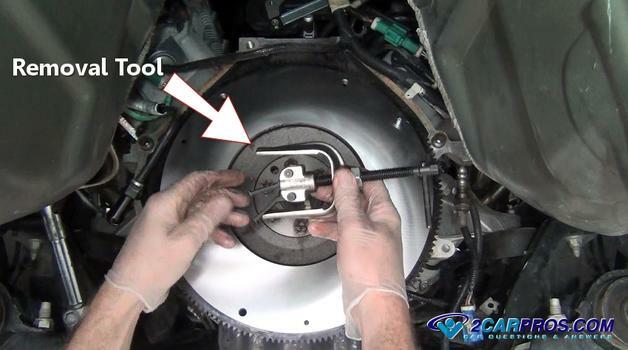 Release the bearing by turning the tool handle counterclockwise. Use a shop towel to wipe clean the end of the crankshaft where the new bearing will be installed. You want this surface to be free from dirt and grease to keep the bearing in place during its operation. 5. Match the New Pilot Bearing: Inspect both the new and old bearings to make sure the inside and outside diameters are the same. There can be no exceptions because the new bearing will either not fit into the crankshaft or it will not allow the transmission input shaft to fit inside if it which in turn will not allow the transmission to be reinstalled. To make sure the pilot bearing will work, fit the bearing over the input shaft while the transmission is removed. 6. 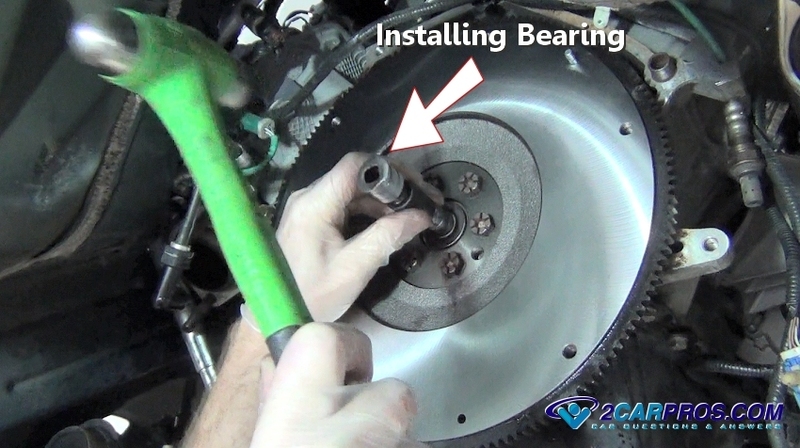 Install the New Pilot Bearing: An old automotive trick is to put the bearing in the freezer for about 30 minutes to shrink it slightly to help ease the installation process. Then gently set the bearing into the end of the crankshaft. Using a hammer and metal drift gently tap the bearing into place. You will get a solid feeling in the hammer when the bearing is fully installed. Do not over strike the bearing to avoid damaging it. This is what it looks like when the pilot bearing is properly installed. 7. Lubricate the Pilot Bearing: The pilot bearing must be lubricated to ensure its proper operation. Use a small amount of axle bearing or silicone based grease and apply it to the inside the bearing. 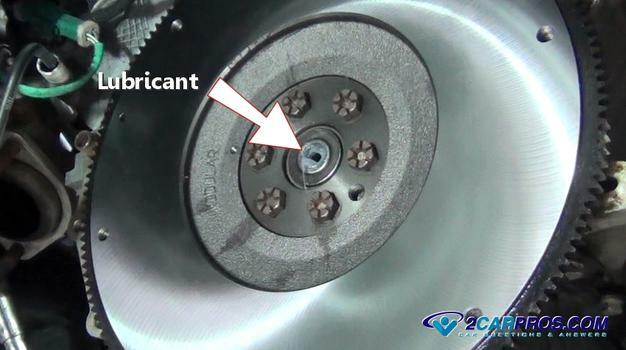 Do not add an excessive amount of grease to avoid getting it onto the clutch disc, flywheel or pressure plate. Now the clutch is ready for replacement and the transmission to be re-installed. This video shows the entire transmission removal and clutch replacement along with the pilot bearing replacement. If you have any questions about a pilot bearing, please visit our forum. If you need car repair advice, please ask our community of mechanics who are happy to help. Our service is always 100% free.